Savannah and Arabella are beginning to play with dolls, so I have been searching the Internet for unique and cute dolls that would be fun to give them this upcoming holiday season. Usually I like to find handcrafted items as they are not only made with love, but make wonderful keepsakes. While searching, I stumbled upon Palomita Rag Dolls on Etsy, and was happy to see these one of a kind rag dolls are made by a mom. Palomita (pa-lo-mee-tah) Rag Dolls are inspired by antique European dolls and are lovingly handcrafted in Eugene, Oregon. 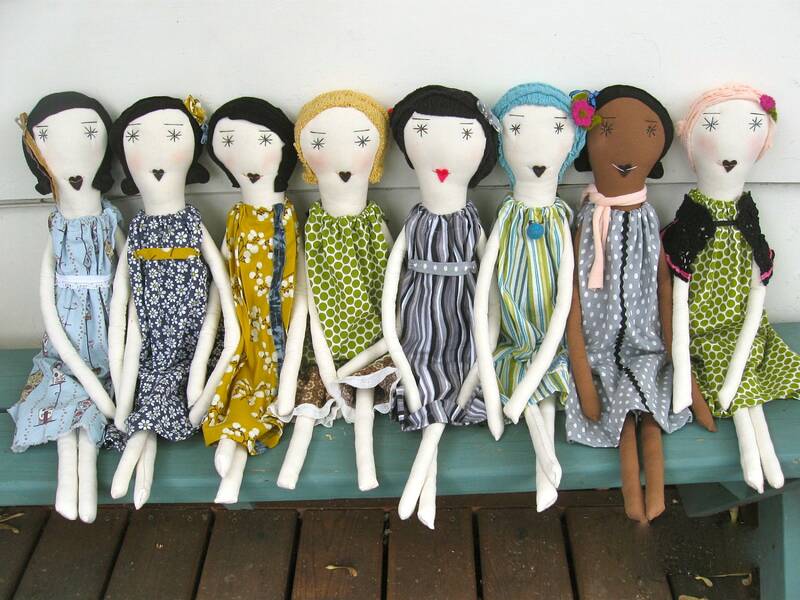 Individually pieced together from a variety of vintage, recycled, new and salvaged textiles, each doll is a unique, one-of-a-kind creation. Palomita Rag Dolls are available for purchase on Etsy http://www.etsy.com/shop/palomitaragdolls. So, I reached out to Jennifer and asked her to share her story with you. Below you will find my Spotlight on Mommy interview with her. Enjoy! Hello! My name is Jennifer Jarman. I work full-time as a registered nurse in a hospital oncology unit and I love my job. I am also a busy Mom to two fabulous young people, Hazel, 16, and Oliver, 12. I am so proud of my creative, talented, hysterical, compassionate kids! I am lucky to have a wonderfully supportive husband, and our family is rounded out by three amazing dogs (rescued mutts). I love to paint, garden, read, sew, design... I have always been a creative, artsy person (I get it from my super creative Mama) and I always have some sort of creative project going on. I am a doll maker. I use a variety of new, recycled, salvaged and vintage textiles to handcraft unique, one-of-a-kind heirloom quality rag dolls. This business arose organically from a combination of several factors, including my constant need for a creative outlet as well as the need to do something with an extensive collection of fabrics, unique textiles and vintage linens that I have accumulated over the years. I started designing and sewing dolls as a child. I was inspired by my mom, who has always been very crafty, and also by the collection of rag dolls that she started for me when I was young. I loved making dolls for my children when they were young. It is something that I absolutely love to do so I just decided to give it a whirl. I have some friends who sell on Etsy, and it seemed like a perfect vehicle to launch the type of small, home-based business that I wanted to create, selling one-of-a-kind handmade rag dolls. There is such a wide variety of things that need to be done when starting and growing a business, that no two days are alike. Each day I spend some time designing, sewing, networking on-line, taking photos, retaking photos, researching how to run a small business, applying to craft shows, packaging and shipping orders, ordering labels and tags and the list just goes on and on. The biggest struggle for me has been the process of learning how to run a business primarily on-line. Etsy offers a lot of support and information on how to do just this and has been a tremendous resource. In addition to making dolls I currently work as an RN, and before becoming a registered nurse I had a wide variety of work experiences, including but not limited to cafe owner, bed and breakfast chef, assistant home-birth midwife and barista. This business is so young, that each sale feels like a huge success! I would say that my biggest success so far has been a large order from a new on-line children’s clothing business, One-Jackson, for their winter holiday boutique. They have a wonderful, unique business concept, check them out! I can honestly say that I have not had any major challenges so far in the development of my business. I want this business to grow in a slow and manageable way, and so far it has been nothing but fun. Lots of work also, but fun work. I would not do it if it wasn’t fun and creative and rewarding. My work as an oncology nurse has given me the gift of perspective... cancer is a major challenge, an order that gets lost in the mail is not. My business is still in it’s infancy stage, so my love for doing it and desire for this business to grow and be successful keeps me motivated. If I am having a long day in my studio, I love being able to take breaks whenever I need to and get outside with my dogs or kids. Sometimes, on late nights in my studio, my motivation is fueled by dark chocolate and red wine. I think that this would have been much more difficult when my children were younger, but they are old enough to actually be helpful and are really supportive and excited about this venture. One of the beautiful things about working for myself and having a home-based business is that it allows me to be home with my family and I can work around my family’s schedule when needed. Also, I think that one of the most important things that women can do to successfully manage a business and their family is to take some time out for ourselves! It is so important to nurture ourselves, spend time with friends or whatever it is that you need to do to relax and have fun. I would like this to grow into a full-time, financially sustainable and profitable business that allows me to work at home and for myself. At this stage I want to take it slowly, as I am still learning so much. I envision my next phase being wholesale and getting into catalogs or on-line stores. As my business is still so young, I'm not sure that I am qualified to give advice just yet, but I would have to say that I have found it extremely helpful to network with other business owners and entrepreneurs and ask lots of questions. I have found so much information and good advice on-line. If you're on the fence, I would say go for it! You'll never know what might have happened if you don't give it a go. I am a huge fan of taking opportunities in life and seeing where they lead us. Are you kidding me? This woman totally ripped off Jess Brown! How pathetic.